Derek McInnes has been impressed with Lewis Ferguson's early impact at Pittodrie. Derek McInnes refused to get drawn into a war of words with Hamilton Accies over their valuation of Lewis Ferguson. Accies vice-chairman Les Gray took the unusual step of publicly expressing his club’s hopes they will get close to £1.25million for Ferguson, when a tribunal meets to decide the level of compensation the Dons have to pay on Monday. Ferguson joined the Dons on a four-year deal in the summer after turning down a contract extension with Hamilton. He made 14 appearances for Accies, making his debut on January 20 in the Scottish Cup after only making the bench six times in the first half of the season. It is understood the tribunal is instructed to consider only what Ferguson had achieved prior to his move, meaning anything he has done in an Aberdeen shirt should not affect his valuation. The Dons are confident of getting a resolution closer to their initial sum of £100,000, whereas Hamilton are holding out for 10 times that amount. Gray said in a national newspaper interview this week that Ferguson was ahead of Dons defender Scott McKenna in his development and that Accies were not going to be a “wee diddy club” that would get done over. He vowed the club would take the process to “the very end”, otherwise it would undermine their youth development process. 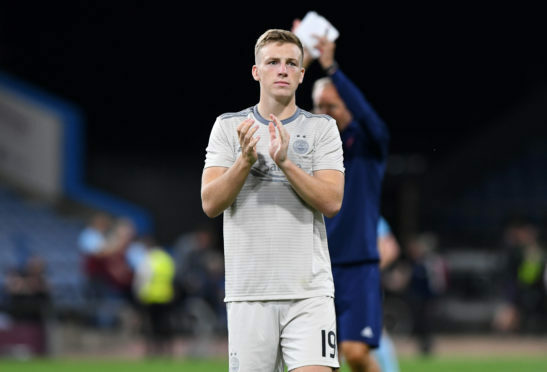 Midfielder Ferguson (18) has started all four competitive games for Aberdeen this season, netting a spectacular overhead kick in the second leg of their Europa League tie with Burnley. McInnes is working on tying down another of his midfielders, club captain, Graeme Shinnie, on a new deal. Shinnie’s agent is due to come north in the next month for discussions with the club and the Dons manager is confident of retaining the Scotland international’s services. He added: “I’m quite relaxed about it because Graeme is saying all the right things and seems keen to stay. It is very important to me he stays longer and the offer is in keeping with his status at the club. It’s a strong offer. “His agent can’t come up for a couple of weeks but when he can we will all get together and try to thrash out a deal to keep him here. I’m hopeful but nothing is agreed yet. Graeme has been right up there with the signings we’ve made here, he came as a free transfer and has given us a return instantly.